4GiftPack specialize in manufacturing and wholesale custom made paper bags including paper shopping bags,laminated paper bags,luxury paper bags,Euro tote bags,kraft paper bags.As bespoke paper bags,they come in any size and shape.4GiftPack can print custom logo and image on paper bags. You can select high quality coated paper to build luxury paper bags， laminated with matt or glossy opp film,fitted with finishes process and different handles,print fine custom design.Luxury paper bags are available in any size,color,shape,it is easy to create personalized luxury paper bags for business. printing:offset printing to print any color on luxury paper bags,whether it is pantone color to match business brand,or full color for photographic to display business image. finishes process: hot stamping.embossing,spot uv can highlight business brand and pattern,add more value and elegant feeling. run limit: no minimum run limit,any qty of custom made paper bags is acceptable. 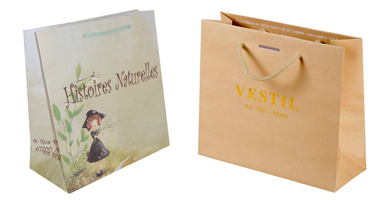 Kraft paper bags have become popular because they are 100% recyclable and reusable,as eco friendly shopping bags,another advantage of kraft paper bags is that they are cheap.Because kraft paper bags are made from brown kraft paper and white kraft paper,so we also call them as brown kraft paper bags,white kraft paper bags.Those green kraft paper bags are available in any size,color and shape to fit business demand at economy shopping bags. 4GiftPack specialize in manufacturing custom made kraft bags coming in full range of style,size,color and shape.Of course even if you just need 250 pcs custom made kraft bags,you can get great competitive price too. 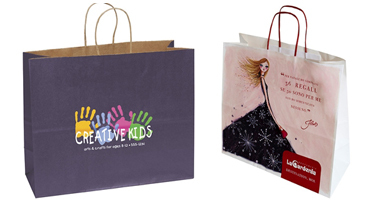 no run limit:whether you need twisted handle kraft bags,or luxury kraft paper bags,there is no run limit,even if you just need 250 pcs custom made bags for event,we can produce them for you at great cheap price too. 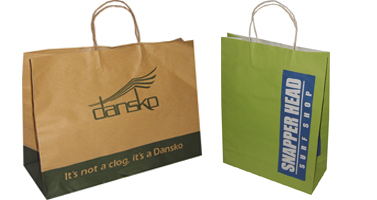 If you want elegant shopping bags or promotional bags,laminated paper bags are the best choice.Laminated paper bags are made of super fine coated paper with glossy or matt lamination,so laminated paper bags offer the best printing effect,silk and luxurious feel,as well as strong construction for long lasting.With custom printing,laminated paper bags are not only as shopping bags to convey high value products,but also as promotional tool to advertise business and products information. 4GiftPack specialize in manufacturing quality laminated paper bags,we can print your logo and image on laminated paper bags. Our finest collection! 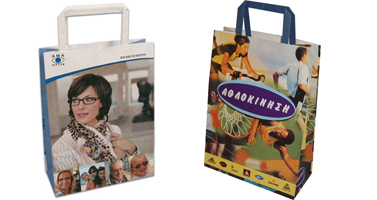 Euro Tote Paper Bags are the top of the line at 4GiftPack. Constructed of heavyweight laminated paper with your choice of gloss or matte finish. These bags have fold-over tops and matching four-knot cotton cord handles,ribbon handle or die cut handle for carrying comfort. Bottom boards are included to add more strength for long lasting. If your goal is distinctive elegance, then this is it. 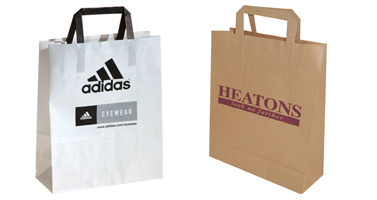 4GiftPack specialize in manufacturing euro tote paper bags,we can print your logo and image on Euro tote paper bags.